I'm loving the entries in my Retro Summertime challenge! You still have a couple more days to join in. This challenge continues until the end of the month: Friday at 2 pm CST. Whether you love the heat or the A/C, enjoy a little summertime creativity for a chance to win $15 credit in the drawing. 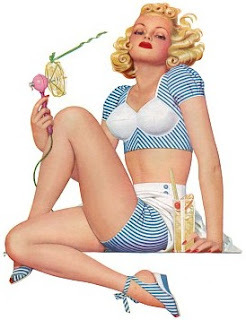 << This retro pin-up girl, with her tall cold drink, hand-held fan, and truly fabulous blue-and-white summer ensemble, is a freebie to get you started!